The Nitro M mid-sized blade will fit the widest range of paddlers. 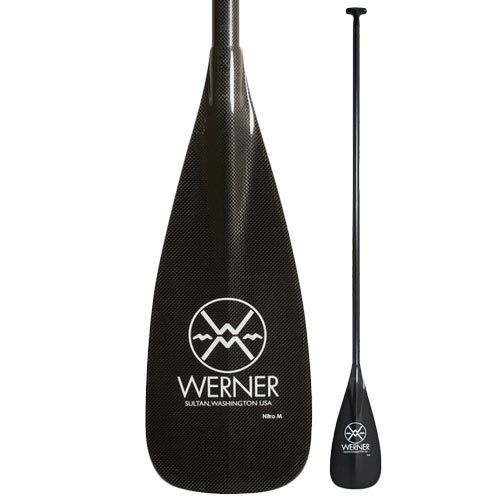 It offers a light and buoyant feel on the water and a smooth back face for a quite stroke. This is a versatile use paddle that is at home surfing, charging down wind or touring. Progressive mid-size rectangular blade, ideal for larger, well-conditioned paddlers, allows for incremental power with less immediate catch for an easier, gentler feel on the body. Optimized flex and strength. Choose our carbon Straight Shaft in 1-piece, 2-piece Adjustable or 3-piece Adjustable or Bent shaft. Dynel® edges protect the paddle from the rigors of all around SUP use. Seven degree blade-to-shaft offset offers great forward stroke while freeing the blade from catching while surfing. Full carbon Palm-grip is designed for maximum control and light weight. Surface Area 100 sq in.